How do I add a new Pinterest Account? 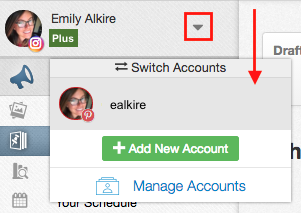 You can connect as many Instagram and Pinterest accounts (aka profiles) to your Tailwind Dashboard as you'd like! Every new account you add will default to the Free Trial plan, and at any stage you can upgrade these to the Plus plan. Click the button below or follow these quick steps! 2. 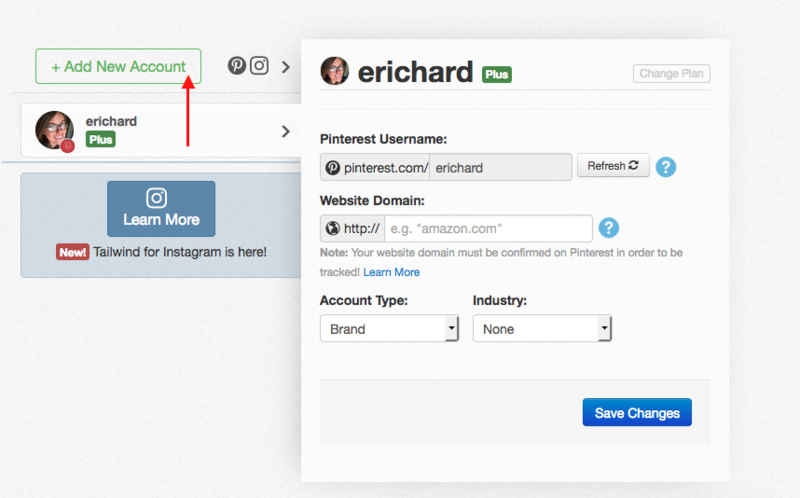 Make sure you are logged in to the correct Pinterest or Instagram account on the desktop web version before you add the new account! 3. Click the "+ Add New Account" button just above your current account. 4. Choose a Social Network to add and Authorize the Tailwind App. Each new Pinterest account you track is a unique account in your Tailwind Dashboard. You can manage many different accounts under a single Tailwind login in the mobile app and the desktop web dashboard. Go to any page in the Tailwind Dashboard. Click the downward arrow next to your profile image in the top left-hand corner. 3. Click the new account to switch to. Important: Please note that the Plus plan includes one social account/profile only. If you'd like to access the Plus plan features on all of your accounts you will need to upgrade each profile to Plus individually at $14.99 per mo or $119.88 per year, each.